Ridge Graham, Amy Adams, Jessica Albright and Bobby Jones traveled from North Carolina to travel on behalf of ACT against Coal Ash Members, speaking out against the proposed rollback of the EPA's 2015 Federal Coal Ash Rule. 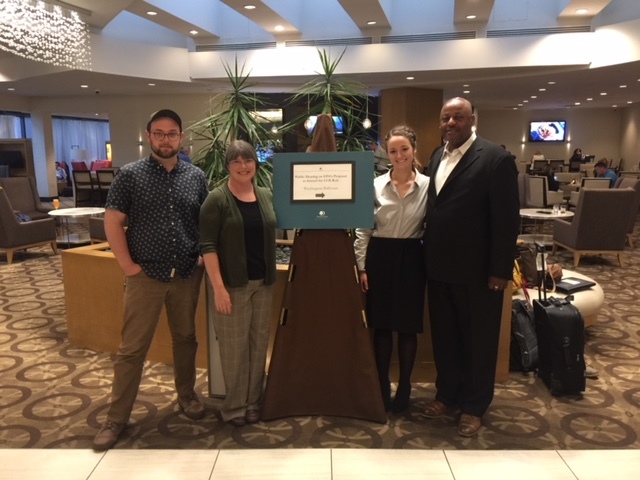 This week our partners from Appalachian Voices traveled to Arlington, VA to speak for three North Carolina moms, who are opposed to the EPA's Proposed Rollback of the Federal Coal Ash Rule. According to Talking Points from Earthjustice, the 2015 coal ash rule was already the weakest regulatory option to benefit utilities, states and recyclers. Now those minimum standards are at risk of being abolished. Appalachian Voices is collecting comments online for the EPA through April 30th deadline. As always, we can rely on Lisa Sorg of NC Policy Watch to keep us abreast on the latest coal ash news impacting North Carolina, including her feature on the overwhelming opposition shared at Tuesday's hearing in DC. This Earthjustice analysis provides more extensive information about this proposed rollback. Margaret Talbot came to visit Belews Creek last fall as part of her recent story "Scott Pruitt's Dirty Politics" in the April 2nd issue of The New Yorker. This extensive look into Scott Pruitt includes an overview on how federal rollbacks will directly impact citizens, including those living in Stokes County. The story highlights a faded memory of my own childhood, during which I had severe asthma: "Kids wrote their names in the ash that blanketed their parents’ cars and corroded the paint." Now I know, I was drawing smiley faces and phrases like "Wash Me" in a blend of toxic heavy metals. The thought of rolling back regulations to life before the smoke stacks and well monitoring are frightening. Thank you to Amy Adams, Ridge Graham and Jessica Albright, who shared the testimony of Deborah Graham from the Buck Community in Salisbury, Amy Brown from the Belmont Community, a suburb of Charlotte, and myself speaking on behalf of Belews Creek. Both Amy and Deborah have been living on bottled water for over three years. Amy finally received hook up to a permanent water supply on Day 1 of her third year on bottled water. But Deborah Graham, who was featured in the documentary, "From the Ashes," continues on living the struggle of dealing with countless bottles of water and is concerned about who will protect our families if the EPA will not. Other advocates who spoke on Tuesday include Bobby Jones, one of our ACT community members from Goldsboro, and Frank Holleman, lead attorney from the Southern Environmental Law Center, who are both featured in this news story. Thank you for taking our comments. My name is Caroline Armijo. I am a resident of Greensboro, North Carolina and I advocate for my home community, which surrounds the Belews Creek Steam Station, along with all of the communities impacted by coal ash in North Carolina. I am gravely concerned about the rollback of regulations that we see proposed here today. As community members, we know that industry self-reports these regulations. But they are helpful and critical to our health. We hope that through the data collected, we can figure out how to clean up our communities, so that they may once again thrive. However the strides being made to correct these issues are in jeopardy. It is important that they remain in place for the sake of our citizens, who are bearing the hidden cost of our electricity in the United States. As a mother, I am particularly concerned about the health protections of children. I was sick as a child with constant respiratory problems until I moved away to college. So I empathize with all of the families who face the host of illnesses associated with poor air and water quality. I am also concerned about the rising trend of obscure cancers impacting children in groups around many communities in North Carolina - brain and blood cancers around Belews Creek, thyroid cancer in Marshall, and ocular cancer in Huntersville. The number of individuals with cancer in all of our coal ash communities are not normal. Although many of these proposed changes disturb me, the most horrific is eliminating the requirement for industry to respond immediately to coal ash spills. In February 2014, it took Duke Energy five days to stop the Dan River spill from leaking out of a corroded pipe that had been flagged as an issue in the past. They knew where the problem was yet. Yet it took them five days to stop the spill. Only 5% of the spill was cleaned up. It all flooded neatly into the Dan River and the refuse remains hidden in plain site. However just upstream on the Dan, Belews Creek houses over 20 million tons of coal ash, 12 million sitting precariously behind a 40-year-old earthen dam looming over 140 feet high and 27 holes punched in it to serve as a constant drain into the Dan River. A failure at this ash pond would wipe out Walnut Cove and Pine Hall. After a law suit filed by the Southern Environmental Law Center, we know that ash would devour the land upstream into downtown Walnut Cove, directly north through pastures and thirty-five miles downstream into Stoneville. Over eighty structures would be lost. The closest in proximity has 21 minutes to escape. We have no ideas how secondary roads would be impacted, because they are not numbered. It would be a massive crisis, only rivaled by the TVA Spill. And then to think, Duke Energy would no longer be held accountable to respond or clean up the spill. This is unfathomable. Why must we wait for a crisis? We need and demand that all coal ash impoundments are moved away from our rivers and bodies of water to lined landfills or reused as a raw material and stop the importation of additional coal ash from foreign countries.